DreamFurniture.com was launched with the aspiration to distribute quality kids’ furniture fun, affordable, and easy to buy. To fulfill this dream, we came up with an innovative plan to sell brand name children’s furniture in an online marketplace for the best possible prices. Partnering with some of the top manufacturers’ of quality children’s furniture we offer some of the most imaginative kids’ furniture available today. Deciding to be an online-only store, the Dreamfurniture.com team worked hard to create a website that would create a fantastic online shopping experience for parents, grandparents, and, of course, kids. 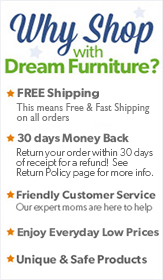 Since the launch, Dreamfurniture.com has become one of the most popular online retailers of brand-name children’s furniture in the U.S—and our reputation keeps growing. The DreamFurniture.com business plan focuses on providing quality furnishings at everyday low prices. With an outstanding customer service policy that includes one-click online shopping, hassle-free shipping and returns, we have everything in place to guarantee satisfaction to our customers.